Two years of an air pollution measurement study were conducted to examine the current air quality in the Meadowlands District (District). These results will provide invaluable information regarding the health and safety of people, animals and plants living in the District. Air toxics and pollutants over the District were measured for a period of two years as part of an air quality study. Results from this study will provide base-line measurements for air toxics and an objective assessment of exposure to air pollutants for people living and working in the District. Between 2004 and 2006, samples were collected every 6 days at four different sites: (NJMC Headquarters, Sports Complex, Laurel Hill (1A Landfill Site). 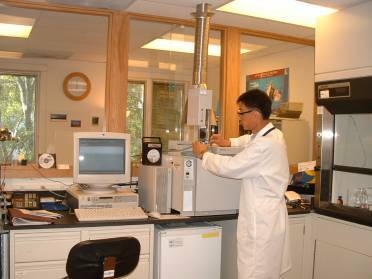 Samples were then analyzed for particle matter mass 2.5 microns or less (PM2.5 mass), elemental carbon, organic carbon, trace metals and Volatile organic Compounds (VOC). Results show that during the same time period, the concentration of VOCs in the District were similar to other urban areas of New Jersey, such as Camden and Elizabeth. The four locations sampled in the District exhibit similar concentrations of VOCs on most days. The concentrations of Benzene, Toluene, Ethyl benzene and Xylene (BTEX) were higher during the winter season. Similarly, no differences in PM2.5 were found between sampling locations. However, summer and winter concentrations were higher than Spring and Fall. Our results indicate higher VOC with the increase in travel during the warm season and a similar increase during the winter because of an increase in the use of heating oil. Computer modeling simulations based on this study’s data are being completed by Rutgers University Scientists (EOHSI). The objective of the modeling component is to verify the baseline ambient air quality in the vicinity of the Meadowlands District due to industrial, residential and transportation activities with actual field measurements.